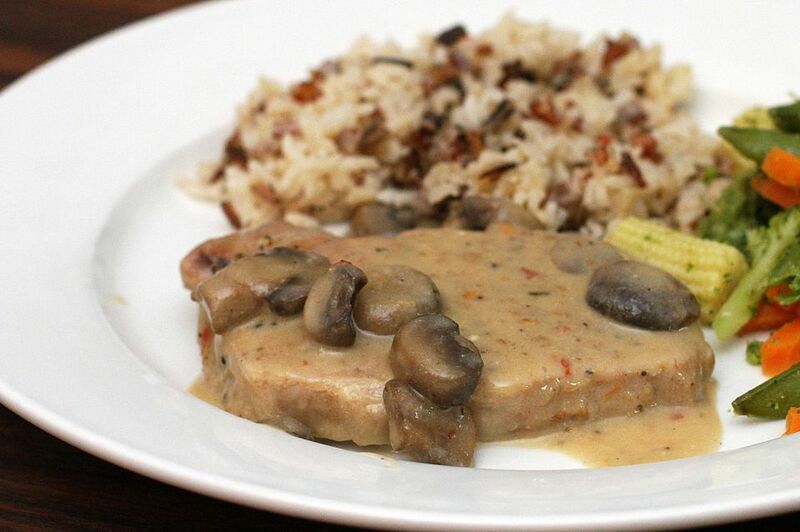 These meltingly tender pork chops are a breeze to prepare and cook in a single skillet. Sour cream and sweet paprika are combined with the rich pan juices and chicken broth to make a delicious sauce. Serve the chops with rice, noodles, or mashed, baked, or roasted potatoes. Green beans, broccoli, or a tossed green salad lend themselves to a complementary side dish. Sprinkle the pork chops lightly with the kosher salt and freshly ground black pepper; set aside. In a large skillet or sauté pan, melt the butter over medium heat. Add the onion and cook until softened, about 4 minutes. Add the mushrooms, if using. Continue cooking until the onions are golden and the mushrooms are tender. Add the minced garlic and cook, stirring, for about 1 minute more. Transfer the onions, mushrooms, and garlic to a bowl; set aside. Increase the heat to medium-high and add the pork chops to the skillet. Sear, turning the chops to brown both sides. Pour off any excess fat, reduce the heat to low, and then return the cooked onions, mushrooms, and garlic to the skillet with the browned chops. Add the bay leaf and chicken broth. Cover and cook for about 1 hour, or until the pork chops are very tender. Transfer chops to a heated serving platter or to a low-temperature oven to keep warm. Cook the pan juices over high heat until reduced by about one-half. Remove the bay leaf. Lower the heat and add the sour cream and paprika. Cook until heated through, stirring constantly; do not allow to boil. Pour the sour cream sauce over the pork chops.